I suspect I would have lingered longer in beautiful Los Angeles with my charming family and friends if it were not for a deadline to arrive in Portland at the beginning of June so I could fly out to Cancun to hook up with my siblings and their spouses and my parents. 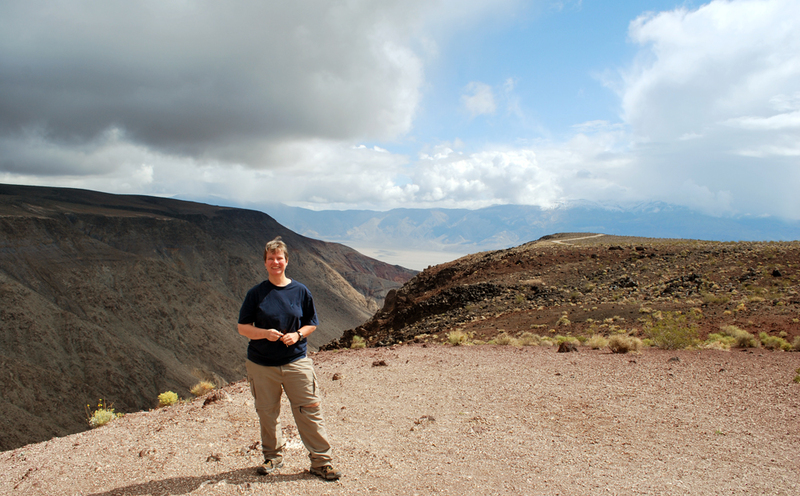 So I bade farewell to my aunt Madonna and pointed BigBlue to the lowest point in the western hemisphere*–Death Valley–hottest! driest! lowest! 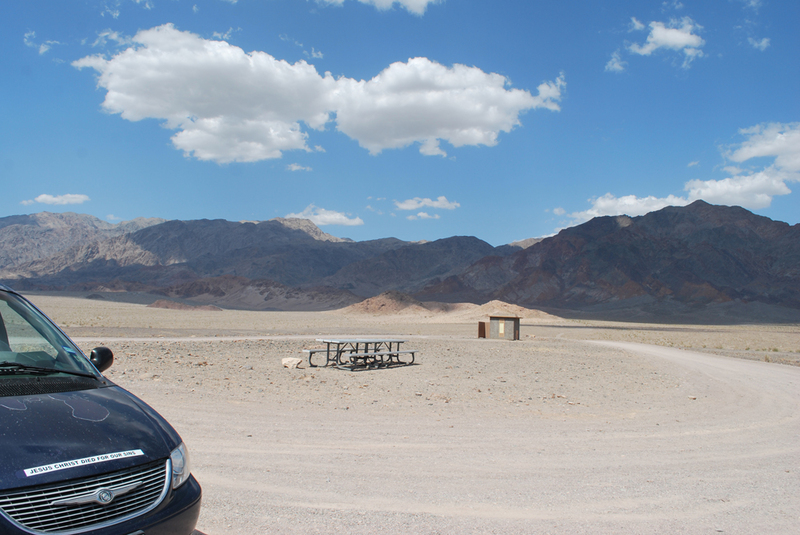 Death Valley rest area on the way to Badwater Basin, the 2nd lowest point in the western hemisphere. Sure! 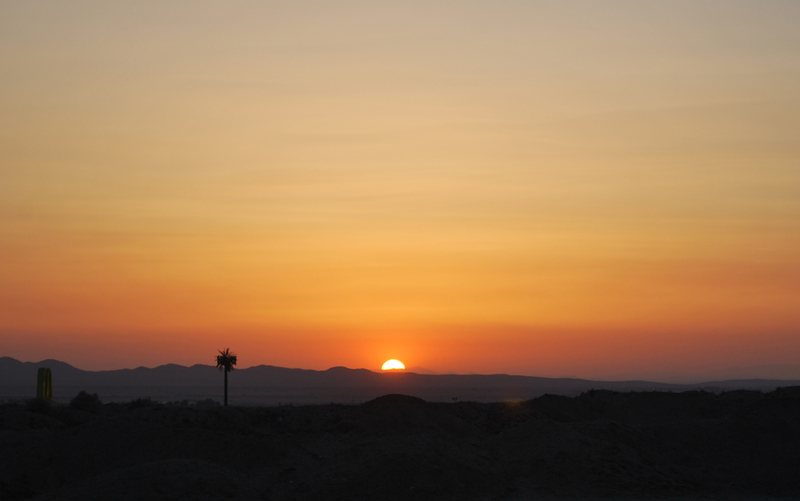 It looks all calm and clear…but within seconds, a sand storm stirred up right after I had poured water over my head! Can you say, “sandpaper hair”?! Before I started this descent into Death Valley, I stopped at Mojave National Preserve and visited the sites provided there (3rd largest park in the 48 states!). I came across a tortoise crossing the street, and since a ranger station was nearby, I drove there to tell them about it. “Oh, we are so glad you did not pick him up. They get scared and release a year’s worth of water-collection to attempt an escape.” If you look at the surroundings, you can get a pretty good idea how much work lost that would have been! 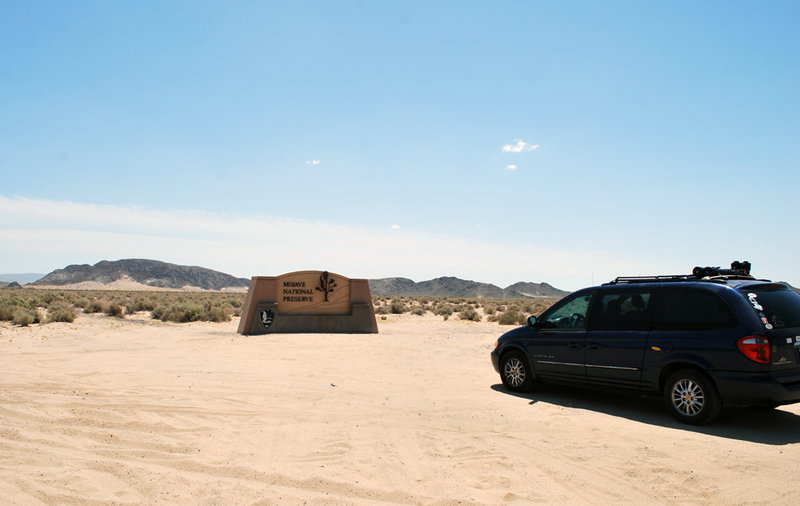 The north entrance to the Mojave National Preserve where 3 of the 4 48 state deserts converge (Sonoran, Great Basin, and Mojave). This was better than Joshua Tree in my opinion…more diversity throughout the park! However, the weather was perfect for the sojourn to the hottest place in the USA, still having a spring coolness about it. The valley and the mountains have a rugged beauty. But oh, it doesn’t take long before one starts to yearn for some greenery! At the lowest point in the north, western hemisphere (Laguna del Carbon is the lowest in the western hemisphere) at Badwater Basin. It is reported to be -282 feet below sea level, but my gps says differently! 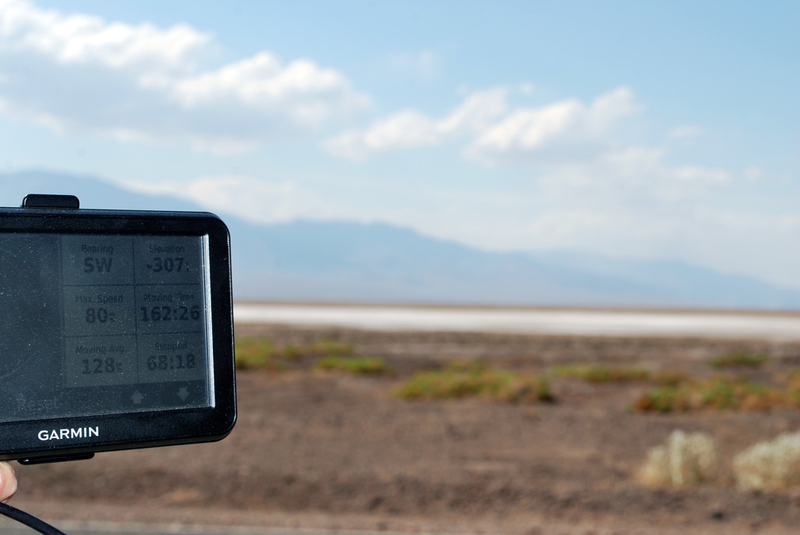 On my way to BadWater Basin (the lowest point at -282′ below sea level [tho my gps read -312′!]) 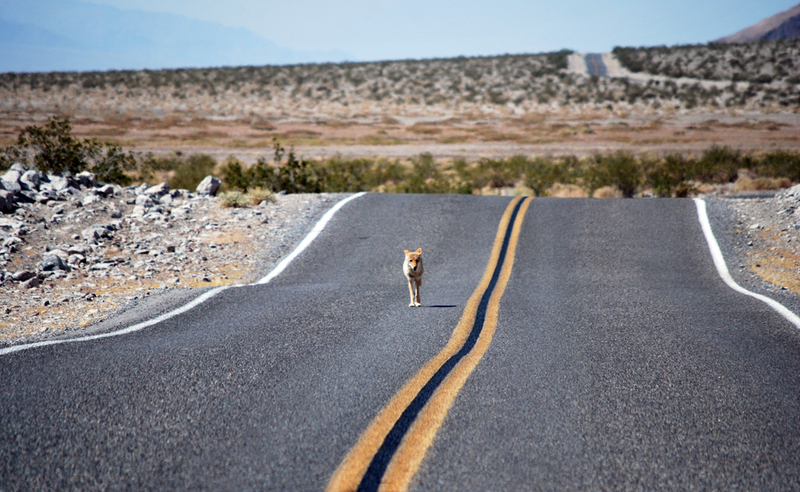 I came across a lone coyote that immediately brought to mind Geico’s commercial about “free-range chicken”, because there he was jogging along the roadway taking in the scenery! Turns out I met up with quite a few coyotes within that 5,000+ square mile national park. One of many coyotes out and about before the sun set behind the mountains. He seems to know traffic laws very well and stayed on his side of the street and made eye contact with any drivers one must navigate about! It is so hard not to feed these “wildlife” critters, but alas! While at Badwater an elderly french Canadian fellow who is traveling the west in his van, saddled up beside me and wanted to travel together. Needless to say, it was difficult for us to communicate because all I know in french is “I have a big appetite for ice cream tonight with my friends!” and “thanks!” His English was a bit better than that, but not much! 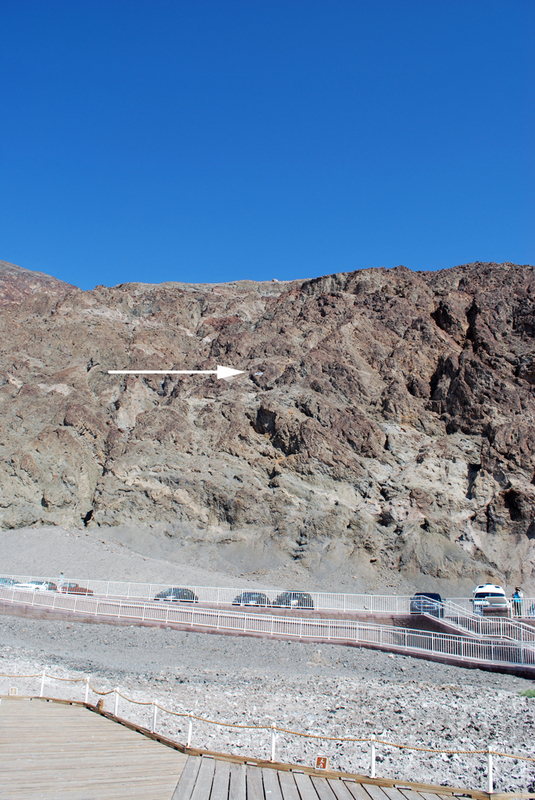 Sea level sign from Badwater basin point…way up there! This area only gets 2″ of rain per year! (btw: the name badwater came from a surveyor who was mapping the area could not get his mule to drink the water from the little that pooled there. So he wrote on the map, next to this place, “bad water!”) and the name stuck! We then made plans to have dinner and camp together (he was going to make spaghetti). But as we were driving to Emigrant Way, an incredible wind stirred up the sand dunes and created such a storm that we lost somehow lost each other and the road. I made it to the nearest camp site and kept an eye out for him as best as I could, but alas, our paths were never to cross again. So I did not have any of the spaghetti for which I was salivating, instead I had a sand-wich…for everything was coated in sand! It was such a wealth of experience to endure my first ever bonafide sand storm! (and bless the poor folks next to me who were in a tent, and had to then endure a rainstorm in the middle of the night!) Oh the stories they will have to share, when they get home! 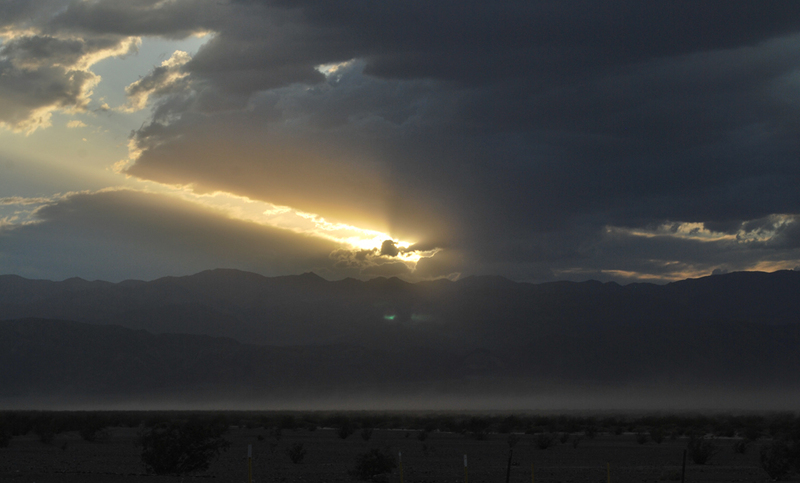 Sunset in Death Valley at the tail end of a sandstorm near the Mesquite Flat Dunes near Stovepipe Wells. Jacques and I were unable to find each other, so blinding was the storm! No spaghetti for moi! 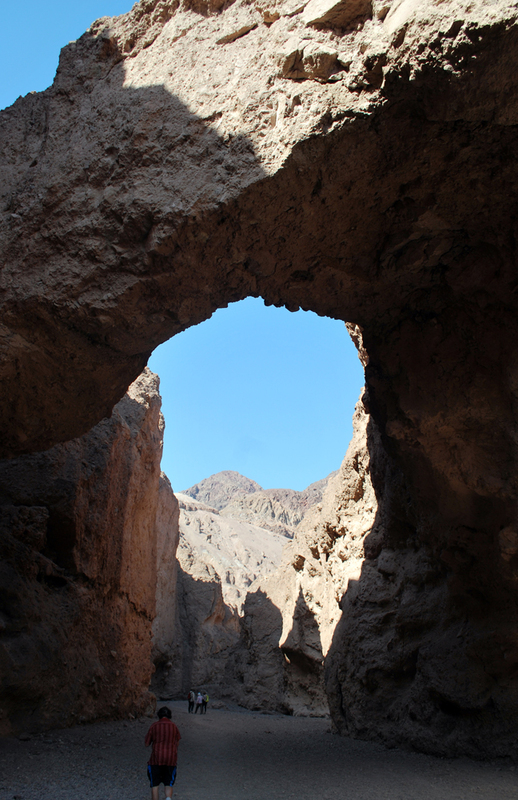 Death Valley is expansive and has many interesting sights and views to occupy one for a good number of days, but the next destination was calling! This is from the west looking back towards Death Valley via Padre Crowley’s viewpint. He was a faithful priest to the people in the whole valley region for about 50 years at the beginning of the 1900’s. I’ll be staying at a lake named after him at the north end of the valley later! 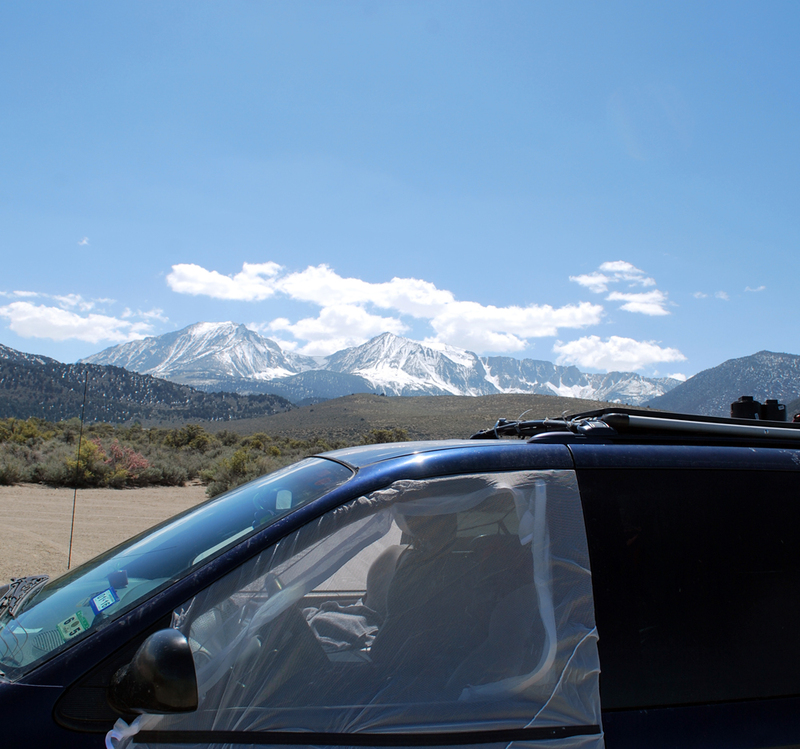 I traveled through Owen Valley towards 395 near the base of Mt Whitney. But alas a storm was brewing in which the fog had it fully covered her, and I never did get full sight of it. 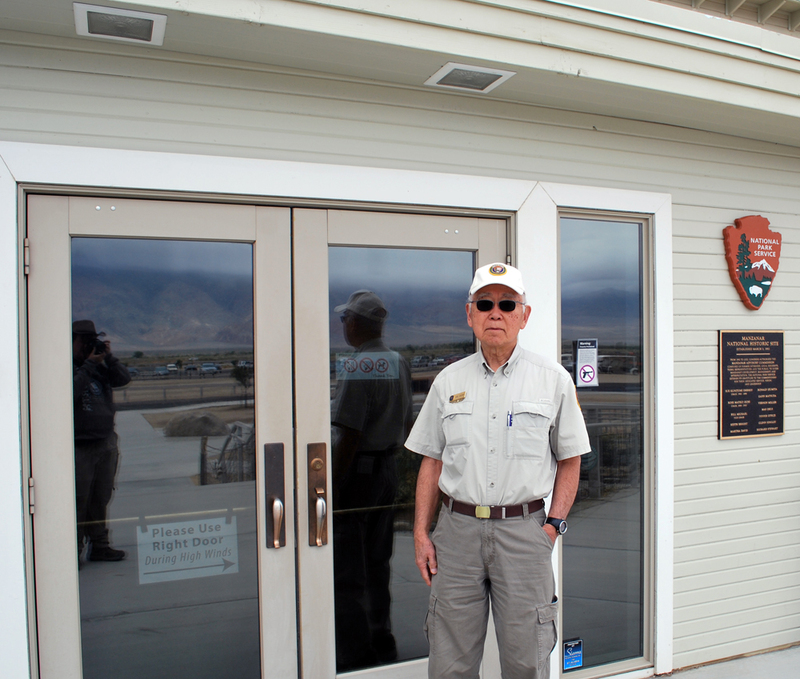 But I was able to stop at Manzanar interment camp national Historic Site and take a tour there led by a man who spent a couple of years there with his family when he was seven years old. This fellow was sent here with his family when he was 7-years old and stayed for two years. He provides tours today at the historical site. He shared that a seven-year-old’s impression of it was vastly different from the sobering reality of what was really happening. As a child he appreciated it because he lived on a lonely farm before the corralling of Japanese American citizens took place, and it made for immediate friendships. But his father bore the burden in such a fashion that the son didn’t have to feel the weight of the family losing everything that they had worked for and earned. As one looks at the desolation of the camp now, it is a marvel to see what pictures of the gardens and beauty of the community they had made out of it, when there were 10,000 people forced to stay there during WWII. While the conditions were compatible for every day life continuing on on a small scale, it is wonder that such a thing even existed. 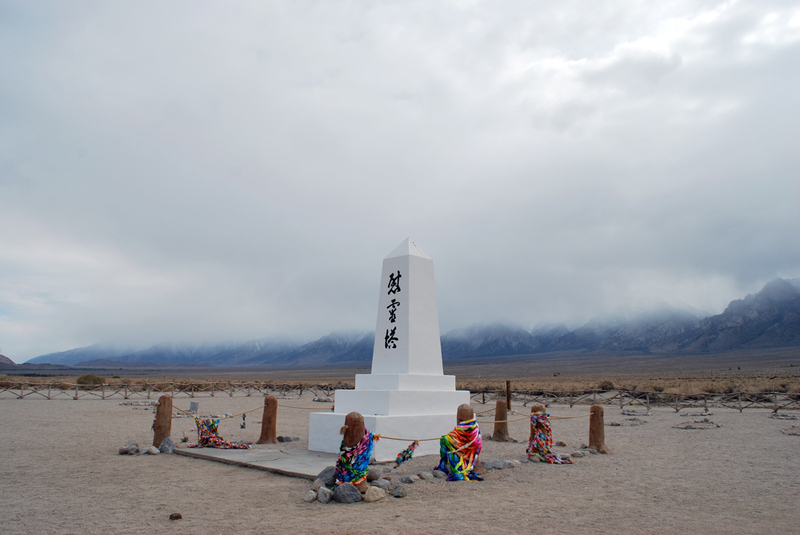 Cemetery at Manzanar Internment Camp at the “Soul Tower.” 150 people died there but only 6 remain buried there, the others either being cremated or moved to another burial ground afterwards. The color hanging from the roped rails are bunches of origami swans all tied together in solidarity. While I was there, the storm that was covering Whitney was dumping 13″ of snow on Yosemite and closed up the eastern pass to the valley. But with good weather being called for the rest of the week, I went ahead and went northward thinking I would be able to wait a few days until Tioga Pass opened back up. Miraculously I arrived at Crowley’s Lake, just east of Yosemite, safe and sound, because the fog was so thick I could hardly discern the road ahead of me. Another night was spent at Mammoth Lake and another night at Mono Lake. 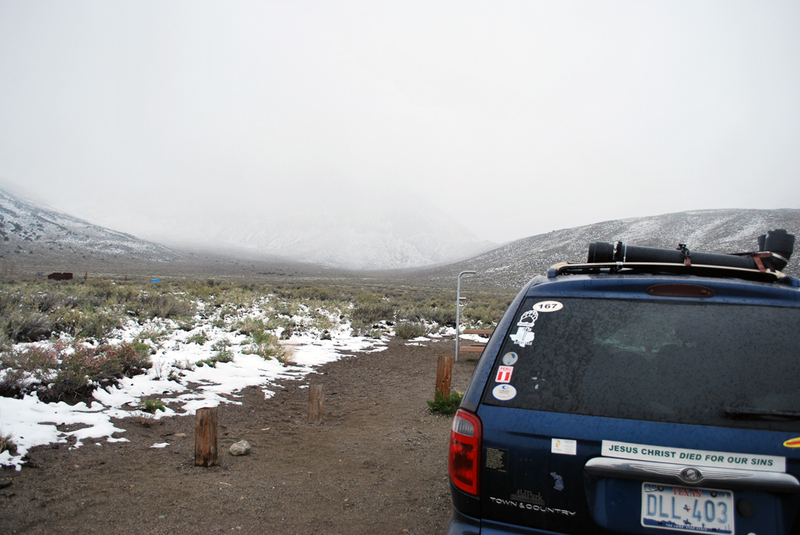 Arriving at Crowley’s Lake on the backside of the storm that dumped 13″ of snow on top of Yosemite. Thank God for gps! The man at the visitor center said it could be a week more before the pass opened. Definitely not what I was hoping to hear. But as I went down to Mono Basin visitor center to take in the sights of the tuftas there, an announcement came over the intercom that Tioga Pass is now open! Well, if there wasn’t a mass exodus from that information station! I had the Mono Basin Visitor Center all to myself for the rest of the day after they announced that the eastern pass to Yosemite was opened! 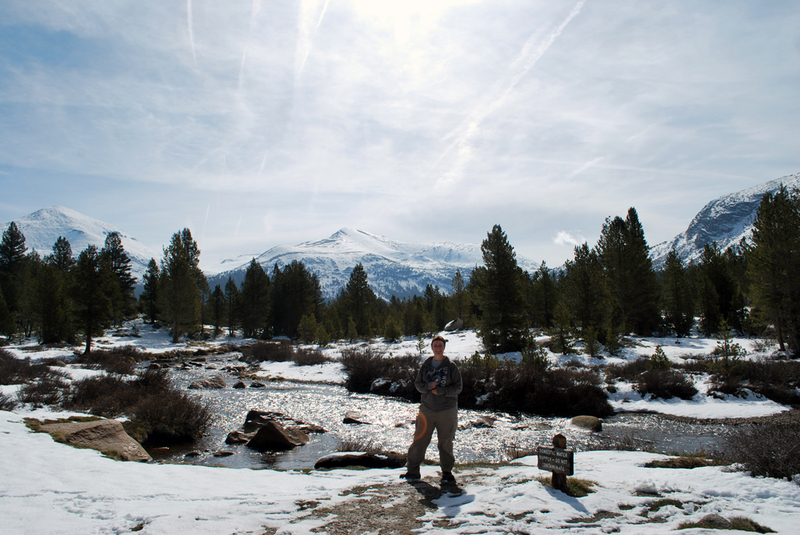 Everyone headed to Tioga Pass and I stayed on one more day in the basin area! 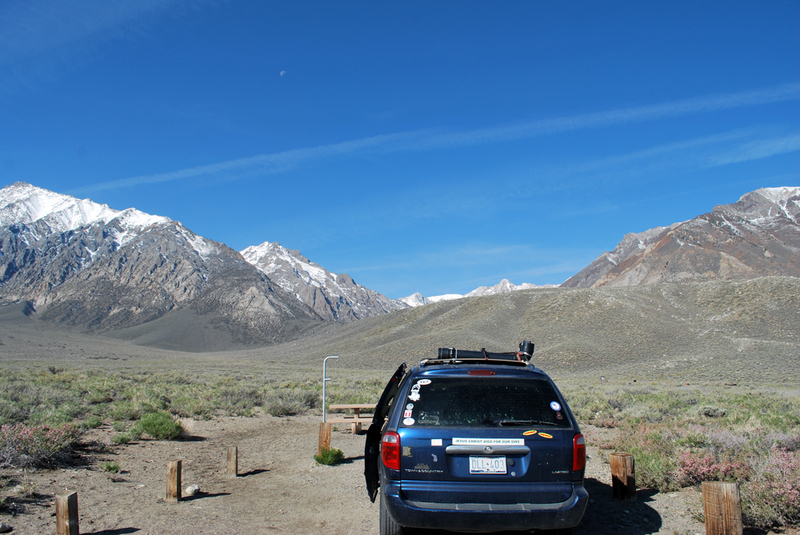 I stayed one night more before setting out over the Sierra Mountains along the highest autopass in the USA. 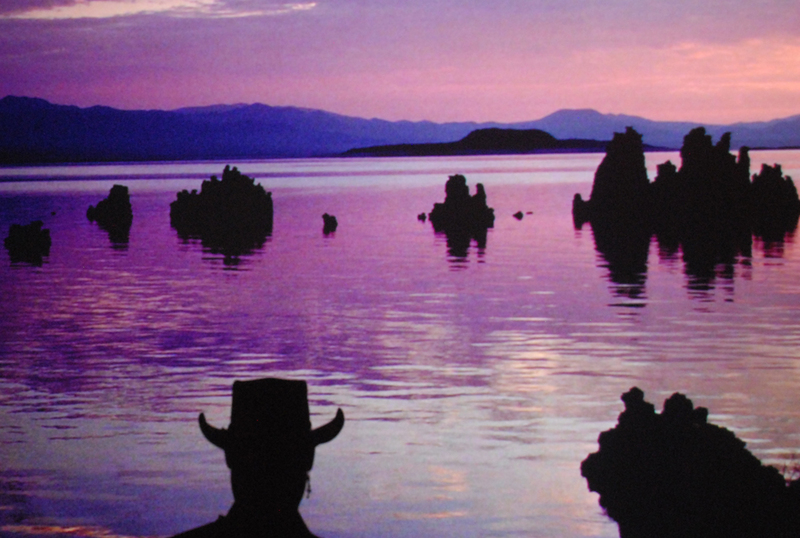 One last night at Mono Lake, sporting my new mosquito-net window screens my aunt Joan made for me. Again, sorry the lake has been overshadowed, yet again, by the mountain shots! California Hwy 120 has become my new favorite. The road that took me across the higher altitude of Yosemite National Park was sparsely populated and incredibly gorgeous with the mountains, snow, rivers, trees and meadows. It was like all good things wrapped up in one package. The Tuolumne River and Meadow were breath-takingly beautiful and simply a delightful place to take a walk. Even though snow covered the ground in many spots (should have taken a pic of the wee snowman I built!) it was spring sweater weather. Here I am at Dana Creek standing on Dana Meadows with Mt Dana on the left and Mt Gibbs in the center…what a glorious place! After staying on the northern side of Yosemite for a while, I headed to the valley early in the morning to make a day of it. The price of camping in the Valley was more than I budget for sleeping, and besides it was quite crowded…okay, very crowded! But understandably so because the beauty of Half Dome, Lower and Upper Yosemite Falls, Bridal Falls, El Capitan, Sentinel, Merced River, the lodge, etc is all so captivating. But I only spent a very long day there and headed to the Sierra National Forest just south of Yosemite. 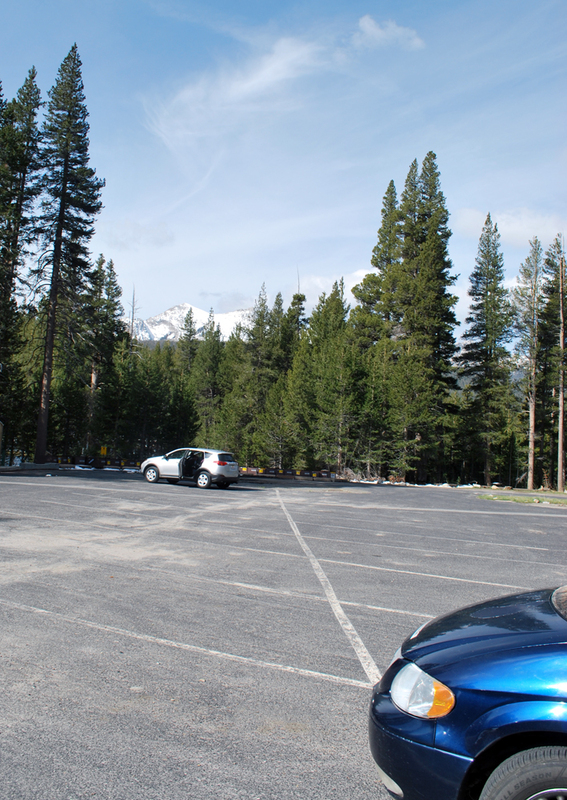 The Tuolumne Visitor Center’s parking lot with Cathedral Peak in the background…ahhh! 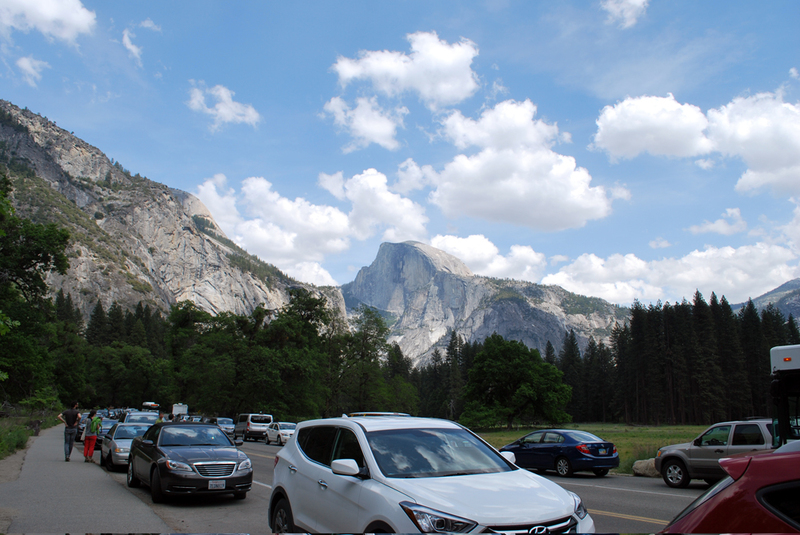 Yosemite Valley’s road (which looks like a parking lot) with Half Dome in the background. Very crowded in the summer! The not-so-crowded side of Half Dome! But there was a family up there who were willing to take a photo for me. Gorgeous weather matched with a gorgeous view! 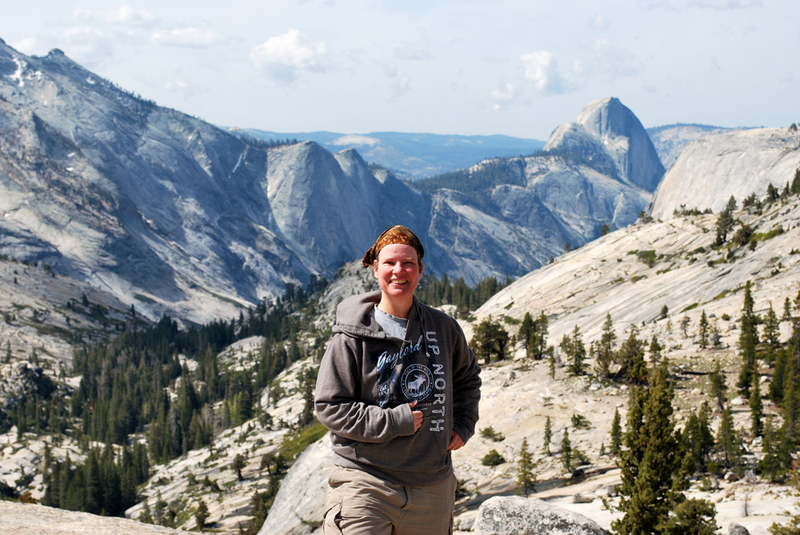 Kings canyon overlook — it is after going deep into the depths that I was really able to enjoy the meadows, falls, picnic areas, and trails. A jewel to be sure! But at King’s Canyon it didn’t matter. As long as I was willing to drive highway 189 down to the road’s end (I would name the road Gillette Corridor with all the close shaves between BigBlue and the bluff face nearly jutting out over the road–they do recommend the rv’s abstain from driving the 30 mile road!) I was met with rivers, waterfalls, meadows, flowers, forests, mountains, fire rings and campsites. 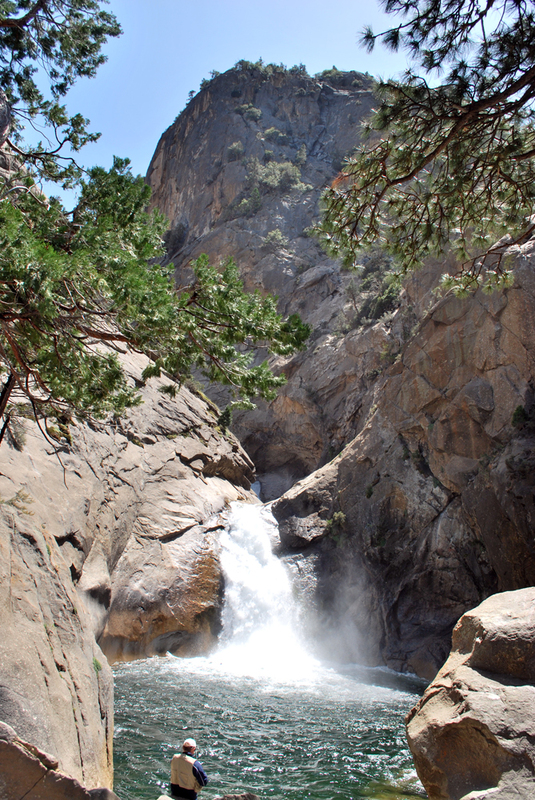 It was hotter in King’s than it was in Yosemite, so that may keep a few of the tourists away. Not all of King’s Canyon is in the national park. Some of it goes through Sierra National Forest and some through Giant Sequoia National Forest. But whatever the case, before the preparations for this trip, I had never heard of King’s Canyon at all, and boy was I pleasantly surprised! Flight of the Bumblebee, King’s Canyon style! 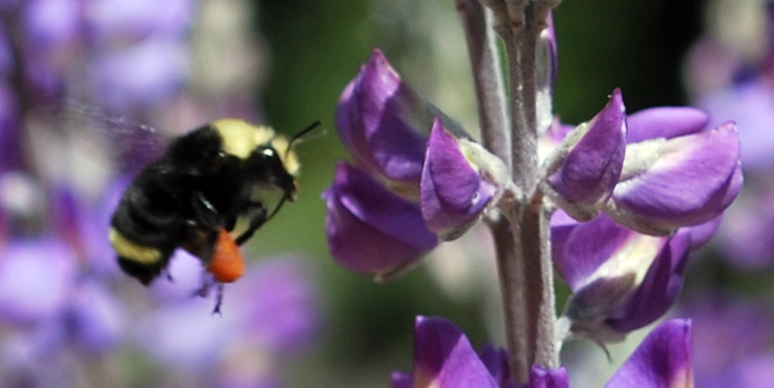 Sacs of pollen having been gathered from the plentiful and beautiful purple lupines! 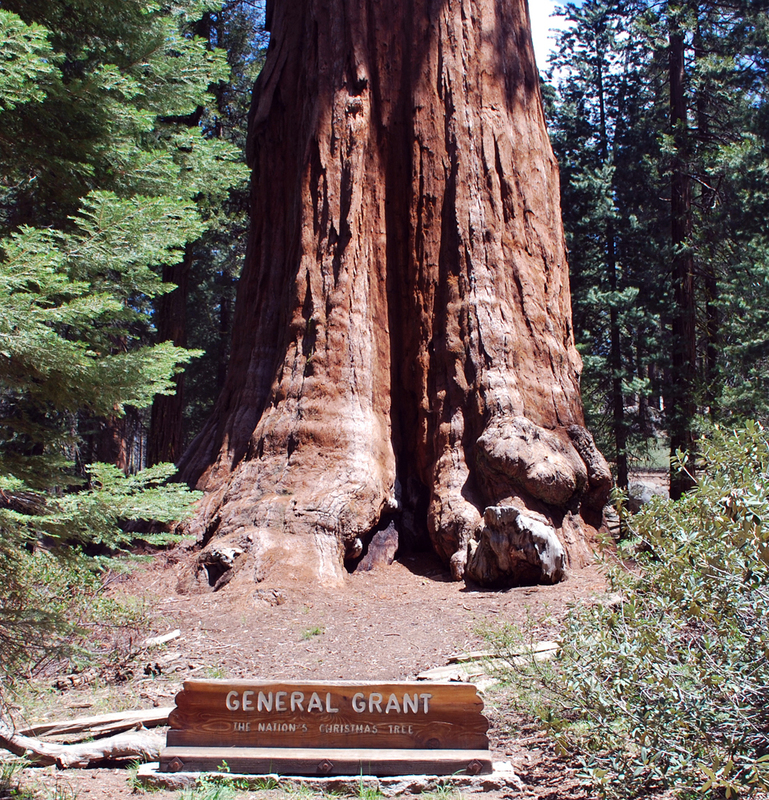 King’s Canyon also plays host to the largest Sequoia tree by girth…that would be the General Grant! I would later keep company with the largest Sequoia tree by volume in the next park with General Sherman. 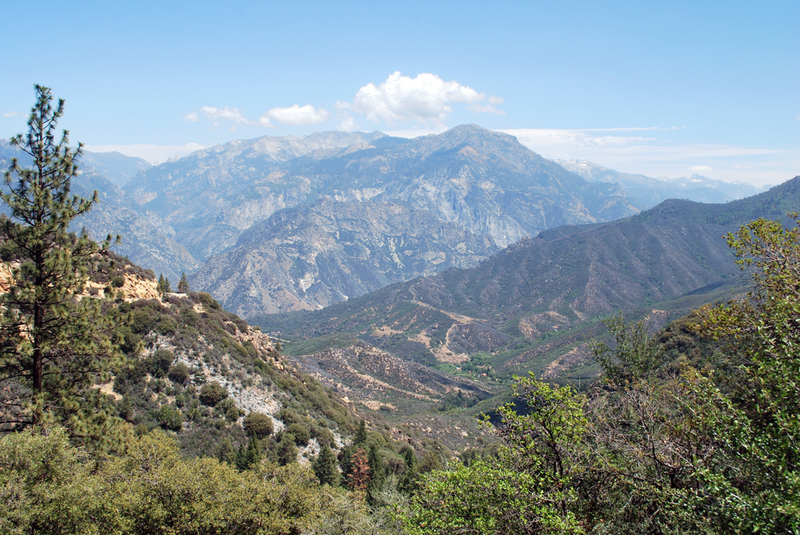 Speaking of the next park, King’s Canyon Park and Sequoia National Park are very closely intertwined (as well as several national forests). You really shouldn’t see the one without visiting the other. The full length of the Generals’ Highway is well worth the cost of gas! (Though 120 still remains my favorite for now!) While King’s Canyon’s road (hwy 180) was a close shave, Sequoia’s General Highway was a plate of wet spaghetti, twisting and turning every which way. Now how is that for some civil engineering?! 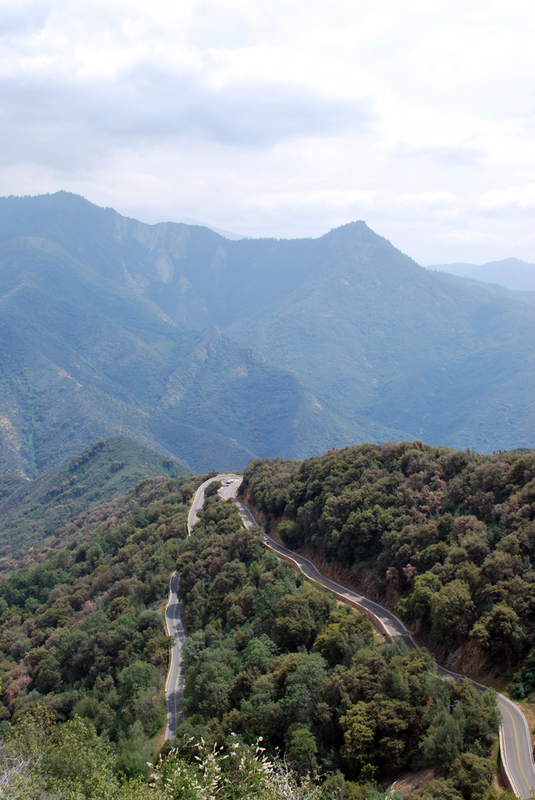 This is General’s Highway at the south end as it is heading out of Sequoia National Park. A real test for a transmission, and passengers stomach strength! There was even one SUV full of young men go-pro-ing the whole trip down. They thought for sure it would make any and all of their viewers sick, themselves included! 10-25mph was the speed limit for most of the trip in the southernn part of the park. Even Earnhardt wouldn’t be able to make it much faster than that! The aroma of the trees, the vistas of the forests, the height and size of the trees…the enchanted forest…or as they call it “Giant Forest Grove”! 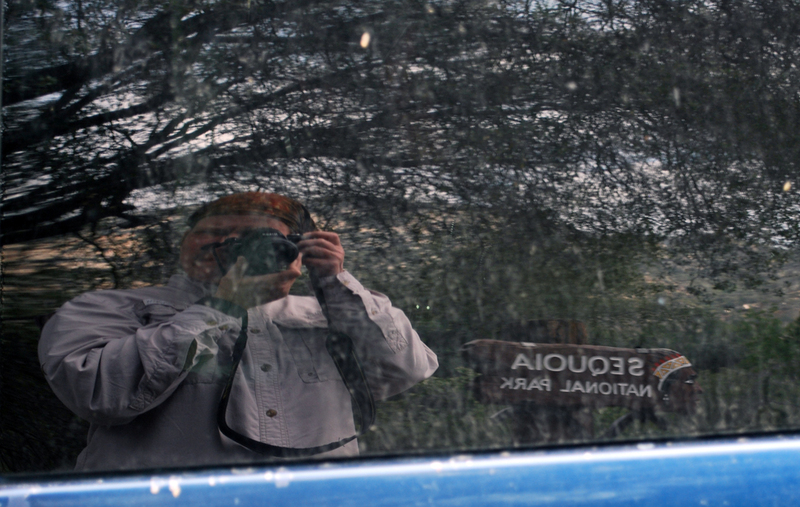 The southern entrance sign for Sequoia National Park reflected in BigBlue’s window, with your’s truly! Generals’ Highway then dumped me right off onto hwy 198 near Lake Kaweah and into the heated central valley. I stayed a couple of days in Paso Robles, which at the time were trying to clean up the city of the marginalized folks as a wine tasting festival was coming to town. As it turns out, they and I, ended up in the same part of town (or should I say “same part of outside-of-town!) A totally different homeless culture than I had encountered so far (urban and vehicle-dwellers). They actually set up camp, kind of like they did during the depression as depicted in “Kit Kittredge: American Girl Movie” out in the rural area. Very interesting culture and people there. I didn’t get any pics of the camps erected for those folks without homes or the people living there, but it has been etched on my memory, and I regret having left only after a few days. Perhaps I shall discover more such camps along the rest of this sojourn. Within a couple of days, while the wine tasting festival was taking place, I headed for the coast via William Hearst Castle. The rolling golden hills of the valley have their own majestic beauty as well...I can definitely see why California (as well as the Warriors) is called the Golden State! 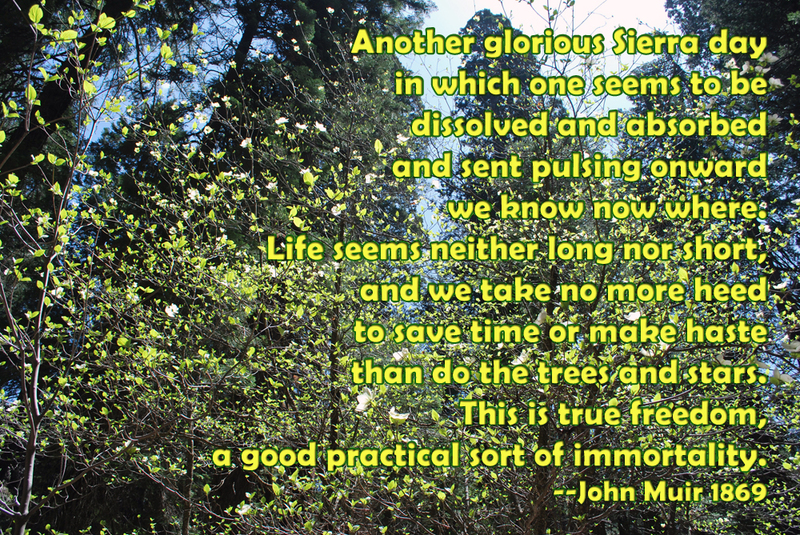 I haven’t read anything by John Muir yet other than the quotes at all the visitor centers, but I’m looking forward to getting more acquainted with him. Here is one I shall borrow having just finished the Sierra Nevada stretch of California! Dogwood and Sequoias intertwined to created a glorious glow! Well, I probably still have another 3 or 4 blogs to write before I even get out of California! On tap for next time, is the coastal drive through Big Sur, Pinnacles, Casa de Fruita (loved that place!) and San Fran and family! Thanks for taking the time to read the sojourns of BigBlue! 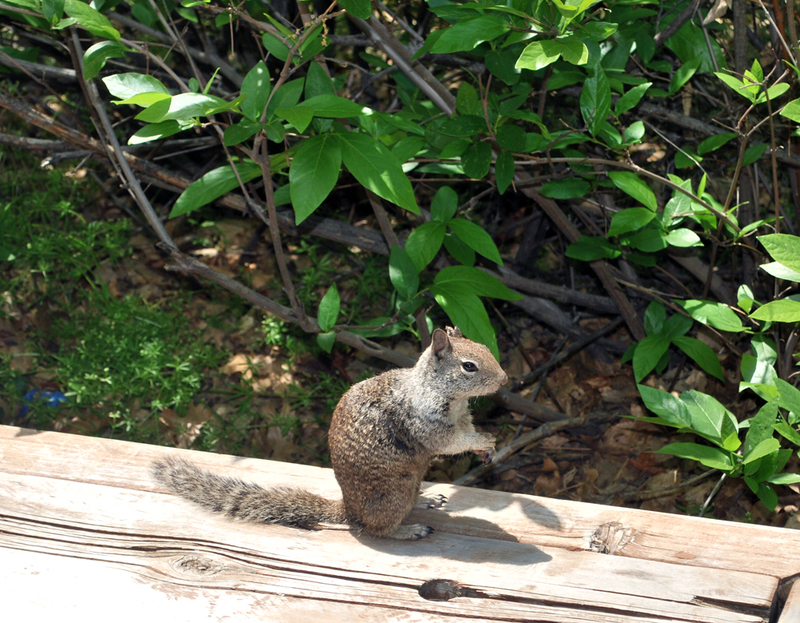 Chipmunks and Squirrels…should be the mascot for nearly every national park…they are abundant! This guy is quite tamed, as he shares this bench at Yosemite Valley with a lady eating a peanut butter sandwich! Wonderful. What a glorious adventure. Can’t wait for the next blog. Really enjoying the updates and hearing about all the people you encounter! Oh how I love this. Your gpa would really love it as well. Take care sweetheart.